Swedes Perform Pioneering Uterine Transplants; Americans Not Far Behind : Shots - Health News The Swedish team transplanted uteruses from two women in their 50s to their daughters, and an Indiana group is recruiting women willing to undergo womb transplants in this country. It's the latest frontier in a field launched in 1954 with a successful kidney transplant. But one expert cautions against premature enthusiasm. A Swedish medical team has transplanted uteruses from two women in their 50s to their daughters. Meanwhile, Shots has learned that an Indiana group is recruiting women willing to undergo womb transplants in this country. "We could go ahead tomorrow if we found the perfect candidate," Dr. Giuseppe Del Priore told Shots. Del Priore says he has already interviewed a number of women, and has the approval of the ethics committee at Indiana University in Indianapolis. While the Swedes did mother-to-daughter transplants, the Indiana group plans to rely on cadaver donors. Del Priore says he believes there would be an ample supply of suitable uteruses from current multiorgan cadaver donors. He says tens of thousands of American women are potential candidates for uterine transplants. They include young women who have had hysterectomies for cancer, endometriosis and uterine trauma. Another group is women born without a uterus. Other medical centers in the U.S. and Britain also hope to begin offering uterine transplants after a decade or so of animal research. It's the latest frontier in a medical field launched almost six decades ago with the first successful kidney transplant. Uterine transplants have one unique feature: They'll be temporary. Once a transplant recipient has achieved a successful pregnancy — or two, in the Swedish protocol — she will undergo a hysterectomy to remove the foreign uterus. That way, she won't be exposed to a lifetime of immunosuppressive drugs with their risks of increased infection and other disorders. A 10-person team at the University of Gothenburg in Sweden did the first mother-to-daughter uterine transplants last weekend. I don't think it's a simple discussion by any stretch. You know, when you're the patient, then you fully understand the issues. When you're just theoretically discussing these things, unless it actually hits home, I think you don't really fully understand it. One of the recipients lost her uterus to cervical cancer. The other was born without a uterus. "They're doing fine, both the donors and the recipients," transplant surgeon Michael Olausson told Shots. "All four women are doing fine." But Olausson acknowledges that the success of the experiment is far from assured. The recipients will be monitored for a year to see if the transplants settle in and behave like normal uteruses — cycling through menstrual periods, avoiding signs of rejection. Then the doctors will implant previously frozen embryos from these women and hope all goes well. By that schedule, the outcome of the experiment will be known sometime in mid-2014. Olausson says he's confident the transplanted uteruses can withstand the mechanical stresses of pregnancy, as well as undergo the growth and complicated remodeling necessary to carry and sustain a fetus. A long series of experiments with mice, rats, sheep, pigs and baboons showed that these animals could accept uterine transplants and give birth to healthy offspring. "So we don't think there will be a problem," he says. One of the women who donated her uterus to her daughter is past menopause. "It does not really matter if they are menopausal or not because the uterus can be sort of refurbished with hormones," Olausson says. "So that's not a problem in itself." Some experts are concerned about the risks of anti-rejection drugs during pregnancy — not only because of possible infection but also because of other problems, such as high blood pressure and premature delivery. But Olausson points out that as many as 15,000 women have had successful pregnancies after undergoing other organ transplants. The Swedish uterine transplants are not the first. In 2000, a Saudi Arabian group transplanted a uterus from a live donor. But within three months, it developed blood clotting problems and had to be removed. Last year Turkish doctors said they had transplanted a uterus into a 21-year-old woman from a cadaver donor, but experts in the field don't believe that has resulted in a pregnancy yet. One leading U.S. obstetrician-gynecologist, Dr. Michael Green of Massachusetts General Hospital, cautioned against premature enthusiasm about uterine transplants. "Don't get too excited quite yet," he told Shots. "[It's] too soon to make a judgment." Green questions whether this kind of transplant is really necessary. When doctors began transplanting organs in the 1950s, '60s and '70s, they started with organs essential for life — kidneys, hearts and livers. Lately they've been doing what Green calls "optional" transplants — of limbs, voice boxes, even faces. "Nobody needs a uterus to live, OK?" Green says. "Nobody needs a hand or a face to live, in fairness. It's a quality-of-life issue. This is in that same category. So we've opened the door. We've stepped through it. And this is one of the next logical things that people might do." He wonders whether health care dollars should be spent on uterine transplants when a woman who lacks a uterus can turn to a surrogate mother to provide her with a child — if she can afford it, that is. But Dr. James Grifo of New York University Medical School says he hopes the Swedish experiment and other such efforts succeed. Grifo has done his own research on uterine transplants but abandoned that work to pursue other priorities. He said in an interview that he was uncomfortable with the possible risks. But he sympathizes with women who might want a uterine transplant. "I don't think it's a simple discussion by any stretch," Grifo told Shots. "You know, when you're the patient, then you fully understand the issues. When you're just theoretically discussing these things, unless it actually hits home, I think you don't really fully understand it." 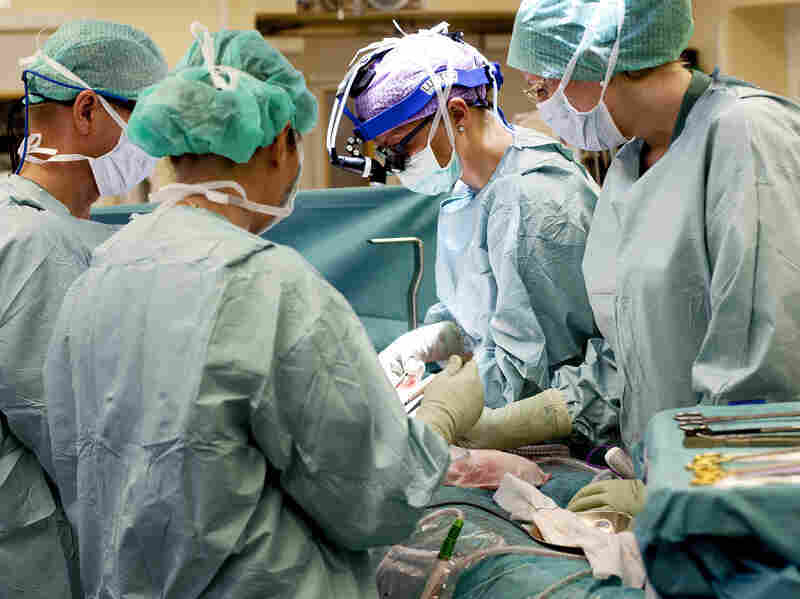 The Swedes plan to do 10 more uterine transplants. The next two could be in a matter of weeks.